The ThINKin' Spot: Sweet -n Sassy Release Party TONIGHT!!! Are you ready for a par-tay?!!! Tonight's the night!! 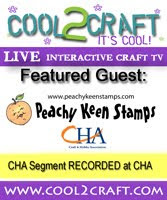 Sweet -n Sassy Stamps is hosting a release party tonight from 8-10 p.m. (Eastern Time) for the release of 5 new stamp sets. Come join in all the fun!!!!! In celebration of the party at Sweet -n Sassy Stamps, I'm sharing a card made with the Birthday Buddies stamp set that is one of the featured sets being released. Oh, my goodness, are there ever some cuties in this set, and five sentiments are included, along with some great little stamps for backgrounds. I guess I'm in a mood for bright cheerful cards, because I was drawn to this K&Co. paper, and the white just seemed to frame everything so well, and make it all pop. I'm so happy you were able to stop by today! It's a cloudy, rainy and dreary day here. I hope it's a beautiful sunny day where you are, but if not, then maybe this card will bring a little light and cheer into your day, as it did mine. May God bless and keep you! Wouldn't miss it for the world Lorie!! Looking forward to it! Oh so pretty!! I am so far behind today!! Missing parties everywhere am I!!! oh well...thanks for the bright and cheery card!! What a cutie this is - that big ol bow makes it look like a little present waiting to be opened! Fabulous card, Lor! Absolutely adorable and again your coloring is amazing! This is just adorable, I love him. And your coloring is fabulous, love that wonderful ribbon also. This little party animal is too, too cute! Love his pink ears and belly! Awww-dorable! And the ribbon is uber yummy! I missed the release but did some browsing...that fox from this set is calling for me! We'll see.....you know, I have dellusions of being on a budget. LOL! What a darling mouse! Beautiful card! ooohhh - I missed it. Man, I have been in my own little world lately. Love the card and next time for sure I will be there!